« CHE Brown Bag April 18th! Join us for the book launch of EP faculty member Celina Su’s debut poetry collection Landia, which questions spatial practices, architecture and cities as they relate to language, the visual, and literature, featuring Caroline Crumpacker, Paolo Javier, EP faculty member Cindi Katz, Alissa Quart, and special guest Youmna Chlala, whose first collection The Paper Camera (Litmus Press) is forthcoming. Both Su and Chlala’s new books intersect with their artistic and academic practices in multiple ways along the lines of race, translation, movement, and displacement. In Landia (Belladonna* Series), Celina Su excavates literal and figurative borderlands—redrawn boundaries, architectural palimpsests, underground transport systems—to reckon with the historical and cultural forces that shape our cities and our intimate lives. Co-sponsored by Belladonna* Series, Litmus Press, The James Gallery, Lost & Found: The CUNY Poetics Document Initiative, the Gittell Collective, The Asian American Writers’ Workshop, and the Center for the Humanities at the Graduate Center, CUNY. Thursday, April 26th, at 6:30 pm in the James Gallery. For more details, see Event Info. Landia excavates literal and figurative borderlands—redrawn boundaries, architectural palimpsests, underground transport systems—to reckon with the historical and cultural forces that shape our cities and our intimate lives. 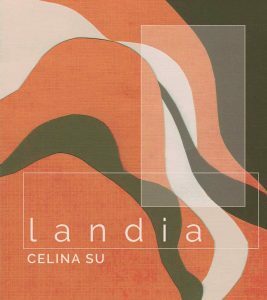 Celina Su’s Landia is worldly in the best sense: it is truly about the world. A capacious and much needed response to America’s rising xenophobia… this most sophisticated poetry about our networked society is a set of maps of our shifting and vanishing neighborhoods, tastes and citizenships. “I cannot differentiate the homage from the lament,” Su writes. Landia is both. You will finish it all the wiser. In her impressive debut collection, Celina Su extends the possibilities of the poetic, bringing as much careful attention (and firsthand experience) to the concrete details of what she calls “prosaic subjection” as she does to the syntax and moods of poetic language. In this particular political moment, the poems in Landia feel especially urgent… Landia brings together the freedom of the poetic imagination and the realities of state and corporate power, forcing us to re-think the borders of the literary and of the political.